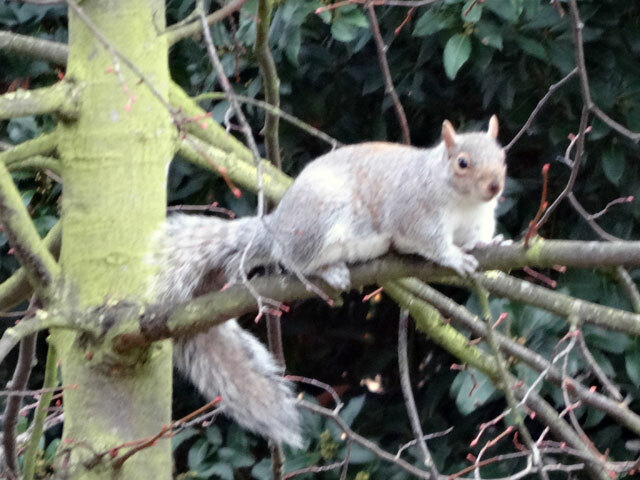 I took this picture of a squirrel last week when we were in London. We were walking through Green Park and everywhere the wildlife was as tame as could be. I love the fact that the new National newspaper gives over its centre pages to a picture of the day -- one day I'll take a picture good enough to grace its pages! Neither Tom nor David were coming today so I was able to sleep in a little. I thought yesterday that my cold had disappeared, but it was at that strange stage when it disappears from the head and has not yet started on the throat. Today it has reached the throat and my voice has gone a little awry. I thought that today I would try to get furniture into the Bothy so that it can be used. Rachel assisted me to move the green leather armchairs from the summerhouse into the bothy, replacing them with my club leather chair from the Granary. (I need to have leather chairs everywhere I work because of the dogs who like to relax in them.) I found the cushions for the green sofa in the big barn and then Rachel and I uncovered the sofa itself in the carriage shed and Tom kindly nipped round for ten minutes to help me lift it into the Bothy. Tom is also showing signs of developing the same symptoms which I am enjoying – I can feel my cold slowly descending into my chest. As a result, after getting the Bothy organised I retired to bed (partly to try to keep away from everyone else while I am so colded and partly to try to get rid of it). Rachel walked Mix and Rowan in the garden. Other news today is that Mum was at her book group and Oliver will soon start marking examination papers on-line for those who are just about to sit important accounting examinations. Olive was in Fife today meeting some of her students and was taken out to lunch by one of the firms for whom she teaches.